Very soon I will share with you 4 tips on how to write a radio ad that actually works. But first, I want you to think about radio advertising from your point of view as a member of the audience. Q: Why do you listen to the radio? Because you like hearing the same weather report and news headlines every 15 minutes? Q: Where are you when you listen to the radio? On your morning run or bike ride? Q: What do you do when the ads come on? “Zone out” while you wait for the music or chat to start again? 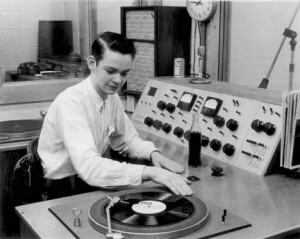 Listen carefully for the latest sales and bargains? You can see that there are a million potential distractions that can prevent your advertising message getting through to your radio audience. And radio is a mass-media form of advertising after-all, so there is a huge amount of wastage (I hate wastage!). and are motivated enough to take action? They say “repetition” because they want you to buy more ads. They say “brand name” because that’s what your boss is more likely to approve the ad because he loves to hear his brand name again and again. As you can probably tell by now, I am not a fan of radio advertising and haven’t recommended it to any of my clients for years. I’ve tried it several times, but it didn’t generate any results. And if you’re not getting results from your advertising (or you don’t know how to measure them), then what’s the point? You might as well flush your advertising dollars down the toilet! But this morning, whilst running, I heard a radio ad that had all the elements of success going for it. I make that assessment on the basis that I heard it once and I remembered several key facts about it. Have you listened to the ad yet? You have? Great! Now, can you answer these questions after listening to the ad just once? How does he distinguish himself from the competition? What should you do next if you want to contact him or find out more? I wouldn’t be surprised if you can answer all these questions. Do you realise how amazing that is? After a single exposure? What do you have to do to write a radio ad like this that at least has a chance at generating results for you? The opening sentence is exactly like a headline in a newspaper. If you don’t like the headline you don’t read the article. It’s the same with radio ads. If the opening sentence doesn’t speak to you, you “zone out” and don’t listen to the rest of the ad. At first, you might think that’s bad, but that’s great! It means you speaking to your target audience directly, and people who aren’t interested are being filtered out. This is just like speed dating. You only have 30 seconds, so do you talk about yourself or do you talk about them? You talk about them of course! Don’t make the mistake of talking about you and your business “we do this, and we do that”. Borrrr-ring! What do people care about more: themselves or what you are trying to sell them? So talk about the listener, what they want, what they need, and use “you” and “your” constantly. You’ve only got time to state 1 fact. The amazing thing about this is that is the fact doesn’t have to be overly impressive, it just has to be distinctive. In this example, Aaron said he was “one of NZ’s youngest celebrants”. Amazing? No. Distinctive? Yes! The #1 most common mistake in radio ads is stating a phone number as the call-to-action. Phone numbers are too hard to remember! (Even word numbers eg 0800 CALL ME NOW). They might rattle around in your brain for a few seconds, but you know that by the time you find a piece of paper and a pen (or your cellphone), they will be gone. So you don’t bother. Need More Help? Need to Generate Better Results From Your Advertising? If you have a small-medium sized business in Tauranga, then I can help you with your marketing and advertising. I hate wastage, so I’ll choose mediums that work, I’ll measure the results, and I’ll make you truck loads of cash. Call me now on (07) 575 8799 or email me for your FREE 45 minute Marketing and Advertising Review. 1. All the best booths gone? Only a few right at the back to choose from? Fine! Don’t worry too much about your location. There’s a fine line between looking desperate, and being friendly and approachable. But the simple act of saying hi has a profound psychological effect. It taps in to a basic human need – the need for connection. In response, most will turn and give your posters and branding a chance to speak to them. Everyone likes a bit of eye candy at tradeshows and expos. If they know your product inside out, all the better. This may be hard to hear, but no-one really cares about your brand. They only care about themselves and if you can help them. So don’t make the classic mistake of branding the background of your booth with huge logos. The trick is to write benefit driven headlines and bullet points. The purpose is to give walkers-by a snapshot of what you do so they can decide if they need your services. This way, you get the visitors who want the benefits you state in your headline and bullet points, to stop and talk to you, and everyone else walks away. Good! That’s what you want! Write a few notes on the back of prospects business cards to remind you who they are later. You could record your impressions about how likely they are to become clients. And for bonus points, write a note about what they told you about their business to jog your memory later, so you can personalise your follow up email to them. You think that just asking people to pop a business card into the fish bowl or entry box is easy right? Yes, it’s easy for them, but it’s hard for you. It’s hard for you to determine if those prospects are real candidates for new business. It’s hard for you to avoid wasting time on those that aren’t. So on your entry form (A6 size, in pads bound with plastic coils work really well) have space to staple their business card to the form (and provide a stapler), and ask them filtering questions about their needs. There is nothing worse than drawing the winner to find someone completely unsuited to being a client of yours. What a waste! In fact, I suggest you go through the entries and throw the unsuitable entries in the bin before you do the draw. 7. What should the prize for the prize draw be? You could go with a voucher for discounts on your services, or you could go with something with a much wider appeal like an iphone. I say cast the net wide by offering the later, and let your entry form do the filtering for you. Have a follow-up plan in place before you go. For example if it’s a 3 day trade show or expo, that night from your hotel, email the new contacts you made, just to say hi (you can sell to them later, this time you just want to stand out from the hundreds of people they met that day). Or you might email the contact details to a staff member for sending out the next morning (using your email address). One time I got a text message from an ANZ business banking rep just to say he enjoyed meeting me – within 5 minutes of leaving his booth! That made a huge impression. Have you been to tradeshows and expo’s here in New Zealand? As an exhibitor? As a visitor? What have you seen or done that worked? Write your thoughts in the comments below. Contact the publisher/distributor and get a special deal for about 50/100 copies of the next issue. Tell them this is their chance to expand their subscriber base and you want them for free. Announce to prospective clients (like at a trade show, conference, expo, chamber of commerce, business after 5 meeting, or pub crawl), that you’re being featured in the next issue of xyz magazine and ask if they’d like a free copy sent to them. When your magazine copies arrive, place your business card and a branded post-it note somewhere in the first few pages. Handwrite a personalised message on the post-it note eg “Dear Bob, good to meet you the other day! Cheers, Dave” (if your name is not Dave, replace that name with your own). That’s how you feature your business in any major NZ magazine! Want More Cunning Ideas For Marketing and Advertising Your Business? Then give me a call on (07) 575 8799 or email me, I’d like to help (first 45 minutes is free). Viral Video – How Do You Create a Viral Video For Your Business? Have you wondered how to create a YouTube video that “goes viral” and creates a torrent of new clients for your business? What other examples of corporate viral videos have you seen? Provide links to them in the comments below. May I help you work on some viral video ideas for your business? Can you detect a complex search algorithm at work here? Me neither. They can take some comfort in the fact that very few websites have a decent search engine, but the rule is “if it doesn’t work like Google it doesn’t work at all”. Their claim to fame is the “do not call/mail” list where citizens such as yourself can opt out of receiving phone calls or mail from advertisers. 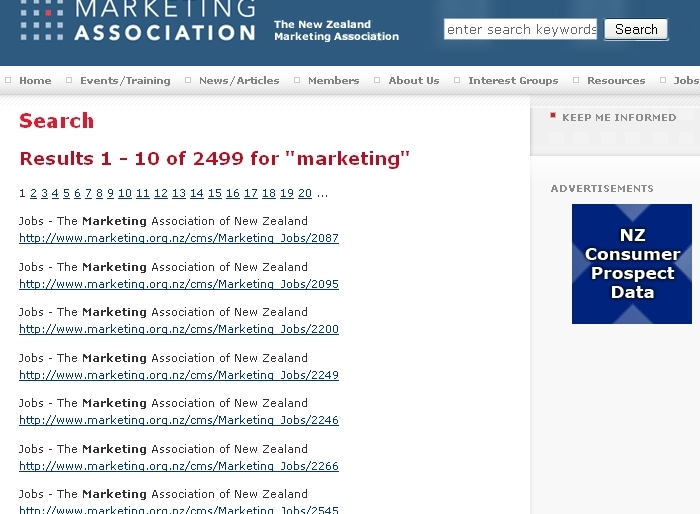 The catch is that only advertisers that are members of the Marketing Association of New Zealand get this list. So the most annoying spammers and market surveyors probably aren’t members. So you will probably continue to get junk mail and phone calls during dinner, even after to spend 30 minutes of your life working through this tedious process. And by the way, the “do not call” and “do not mail” lists are completely separate forms and you have to enter each person in your household separately too. Enjoy. They should just stick to what they’re doing and choose not to distract their visitors from their task. It makes them look cheap. Who do they think they are? The NZ Herald? And I suspect that these 3 customers are not paying the ratecard rate because at $400/month for the homepage and $320/month for the rest of the website, do you think they’ll ever get a return on investment? Marketing is built on communication is it not? Where are the blogs? Where are the Question and Answer forums? Where are the links to other social networking such as Twitter or Linked-in? They should be leading the way with marketing techniques in the 21st century, but sadly, it seems they are stuck in the 90’s. This is poor for users because it doesn’t provide “information scent” – a preview of what they will see on the next page (because often when people read on the web, they scan quickly and read only hyperlinks). And they are missing a Search Engine Optimisation opportunity here too because Google loves keyword rich anchor text in internal hyperlinks. These are 2 standard features that are completely missing from this website, and that is why you will get lost in minutes if you bother having a look around. What the hell is a fax machine anyway? I’ve never heard of it. I shudder to think how many spam emails their staff get. Why do I care? Because I have less confidence that an important email I send them will get blocked or deleted by an overly aggressive spam filtering system. What should they do? Incorporate thumbnails to give it some life, have the full date, and show a few sentences as a teaser. This tells me it has been 4 years since their last major upgrade. And it shows. The site is dated. Are the web developers – Net Concepts to blame? No. I’m not hassling the original web developers: Net Concepts. Infact, their latest stuff is really really good. 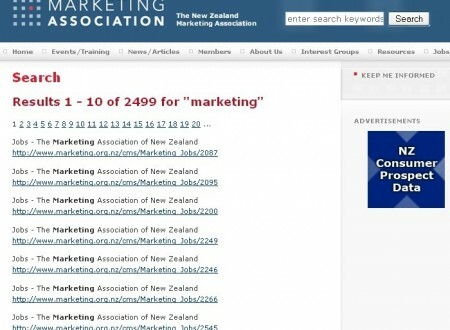 But if I was them, I’d either put pressure on the Marketing Association of New Zealand to let them build them a new website, or ask them to remove the hyperlink, because it’s just embarrassing being associated with them. If you represent the Marketing Association you may be a bit pissed off with this report, but somebody had to wake you up. I’m for hire, I can help you fix these things, so call me on (07) 575 8799. And if you have a website of your own and you want a frank, honest, cut-the-crap evaluation of your website, so you can start generating business from it, you can call me too: (07) 575 8799 (only call if you promise not to cry over the phone when I point out all your mistakes).